Behold a Pale Horse. . .
Graves yawn wide. Spirits haunt the living. Corpses pursue perverse agendas from beyond the grave. The gates to the next world swing wide. Is it the end of the world? Not if hunters can help it. Theirs is the power to put the dead to rest - once and for all. 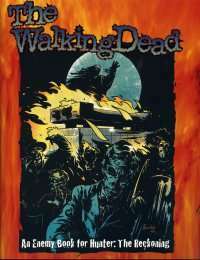 The Walking Dead explores and explains the proliferation of ghosts and zombies in the lands of the living. These monsters are hunters' greatest enemies, for they're everywhere and are clearly abominations to everything right and good. And yet, why does hunters' emergence and the rise of spirits seem to coincide? What is the hidden connection between the imbued and restless dead?